Early the next morning I got up just as the sun rose over Oslo and walked to the Royal Palace. In the morning light, before the city fills with people, the palace is a remarkable sight. June 2014, panorama from 4 vertical images, additional exposures for highlights, focal length 16mm, aperture f/11, shutter speed 1/6 second, ISO 100, tripod. Situated at the top of a rise overlooking a green expanse known as Palace Park, the palace is one of the most accessible in Europe, with tourists posing for selfies within steps of the entrance and children playing nearby. 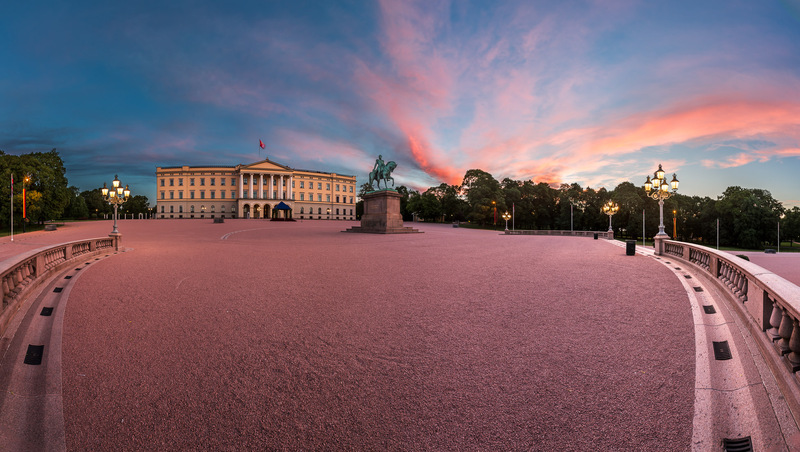 Though it is still used as the residence of Norway’s royal family, the palace and the surrounding park feel welcoming, as if it belongs to the people as a whole. But that morning, with the palace illuminated by soft early morning sunlight, there were no crowds, not yet. I had the grounds largely to myself, free to stroll at my leisure among the trees and duck ponds. On a morning like that, in a not-yet-awake Oslo, it’s easy to see why the royals long ago chose this spot, the Slottsparken, as the location of their residence. It’s hard to imagine a more serene location. My task, before the park filled with people, was to capture the palace in the early morning light, and to attempt to show something of the expansiveness of square in front of the palace. The square is massive and almost more than can be captured by one shot – I used panoramic technique to convey its size and make you feel the place. This entry was posted in City and tagged Norway, Oslo.